My wife woke me up from a sleep the other night with a “What’s that”! At first I thought I was dreaming something I wasn’t supposed too, but then I heard it. A half screech, half howl. And there were a bunch of them. It was about 3:00am in the morning, I was half asleep, I had no clue. At the grocery store in McArthur a few days later I overheard the cashier chatting about Coyotes. So I checked on the Internet, looked up coyote sound bytes and sure enough what I heard resembled coyotes. So now I’m wondering what do coyotes eat, rabbits I suppose, maybe mice, I’m wondering if my cat is in jeopardy? Maybe my dogs too? While I was clearing out my fence the other day I met my neighbor from the across the street and brought up coyotes in our conversation. I wanted to see what he could add to my knowledge base. He said coyotes all-right, we got them. And they’re big too. They spotted some in Hocking Hills region in Hocking County, the next county north of Vinton, that folks thought they were wolves. Turns out they were just big coyotes. He went on and said he’d seen black bears too! What next, I thought to myself, cougars. I no sooner thought it and he said it, cougars, I’ve seen cougars, bigger than large dogs. I guess there must be a lot of rabbits to support a cougar population and coyotes that get as big as wolves? I guess that explains why I haven’t seen a lot of rabbits. Ah yes, wild wonderful Vinton County, Ohio. My Kubota. There are a lot of hills in Vinton County. So much so that I found myself looking at acquiring a new tractor to accomplish the mowing. I haven’t looked at a new tractor in twenty years, there is a lot of choices out there. Searching with Google I found a Grillo, an Italian Tractor that resembled an ATV with a belly mower. Then a Ventrac and Steiner. The Ventrac was owned by the Steiner family which I found odd, both machines were very similar, there’s a story there somewhere. I found a hillmaster, a slopemaster, some machines that tilted to keep the rider upright while the machine was cutting on the slope. A Zero Turn that mowed hills in reverse, how cool is that? Well to shorten this story a bit I ended up with comparing the John Deere 2305 with the Kubota 2660. Both machines reasonably priced and sized right for my property and both looked low enough to the ground, with good low center of gravity and 4 wheel drive, to do the job. The Deere was a little bit wider in stance and mower deck, which is good for side hills and the Kubota had a little more horsepower and cheaper, which is good for my wallet and going up the hills. 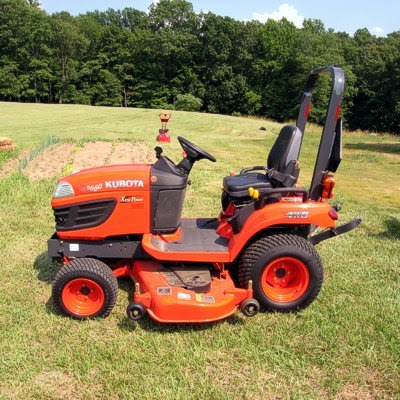 I purchased the Kubota, a BX2660, from Allpower Equipment in Athens, Ohio. The first time I drove the tractor I wasn’t impressed, but after I learned and mowed grass the first time, all I could say was wow! It was one impressive machine. Now I’m looking for a tiller and a brush hog to mount to the the rear PTO. As far as mowing on the hills goes, it works great and the cut looks as if I own a golf course now instead of a field.